German Shepherd Dogs. Female (left), Male (right). Popularity increased again after the German Shepherd Sieger Pfeffer von Bern became the 1937 and 1938 Grand Victor in American Kennel club dog shows, only to suffer another decline at the conclusion of World War II, due to anti-German sentiment of the time. As time progressed, their popularity increased gradually until 1993, when they became the third most popular breed in the United States. As of 2009, the breed was the second most popular in the US. Additionally, the breed is typically among the most popular in other registries. The German Shepherd Dog's physique is very well suited to athletic competition. They commonly compete in shows and competitions such as agility trials. The breed was named Deutscher Schäferhund by Von Stephanitz, literally translating to "German Shepherd Dog". The breed was so named due to its original purpose of assisting shepherds in herding and protecting sheep. At the time, all other herding dogs in Germany were referred to by this name; they thus became known as Altdeutsche Schäferhunde or Old German Shepherd Dogs. Shepherds were first exported to Britain in 1908, and the UK Kennel Club began to recognise the breed in 1919. The direct translation of the name was adopted for use in the official breed registry; however, at the conclusion of World War I, it was believed that the inclusion of the word "German" would harm the breed's popularity, due to the anti-German sentiment of the era. The breed was officially renamed by the UK Kennel Club to "Alsatian Wolf Dog" which was also adopted by many other international kennel clubs. Eventually, the appendage "wolf dog" was dropped. The name Alsatian remained for five decades, until 1977, when successful campaigns by dog enthusiasts pressured the British kennel clubs to allow the breed to be registered again as German Shepherd Dogs. The word "Alsatian" still appeared in parentheses as part of the formal breed name and was only removed in 2010. The modern German Shepherd is criticized for straying away from von Stephanitz's original ideology for the breed: that German Shepherds should be bred primarily as working dogs, and that breeding should be strictly controlled to eliminate defects quickly. Critics believe that careless breeding has promoted disease and other defects. Under the breeding programs overseen by von Stephanitz, defects were quickly bred out; however, in modern times without regulation on breeding, genetic problems such as color-paling, hip dysplasia, monorchidism, weakness of temperament, and missing teeth are common, as well as bent or folded ears which never fully turn up when reaching adulthood. German Shepherds are a large sized dog which generally are between 55 and 65 centimetres (22 and 26 in) at the withers and weigh between 22 and 40 kilograms (49 and 88 lb).The ideal height is 63 centimetres (25 in), according to Kennel Club standards. They have a domed forehead, a long square-cut muzzle and a black nose. The jaws are strong, with a scissor-like bite. The eyes are medium-sized and brown with a lively, intelligent, and self-assured look. The ears are large and stand erect, open at the front and parallel, but they often are pulled back during movement. They have a long neck, which is raised when excited and lowered when moving at a fast pace. The tail is bushy and reaches to the hock. German Shepherds can be a variety of colors, the most common of which are the red, tan, brown, black, tan/black and red/black varieties. Both varieties have black masks and black body markings which can range from a classic "saddle" to an over-all "blanket." Rarer colour variations include the sable, all-black, all-white, liver, and blue varieties. The all-black and sable varieties are acceptable according to most standards; however, the blue and liver are considered to be serious faults and the all-white is grounds for instant disqualification in some standards. 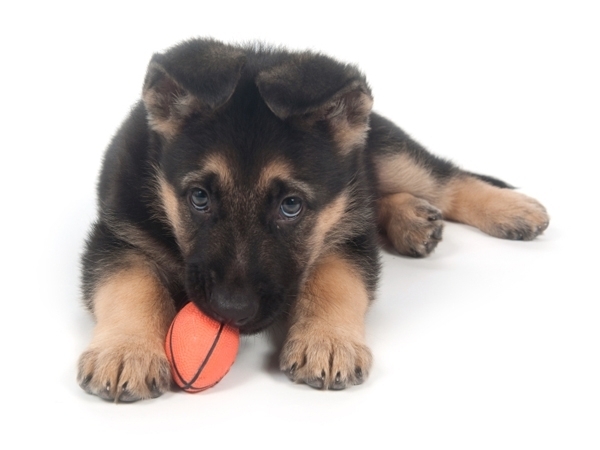 German Shepherds were bred specifically for their intelligence, a trait for which they are now renowned. They are considered to be the third most intelligent breed of dog, behind Border Collies and Poodles. In the book The Intelligence of Dogs, author Stanley Coren ranked the breed third for intelligence. He found that they had the ability to learn simple tasks after only five repetitions and obeyed the first command given 95% of the time. Coupled with their strength, this trait makes the breed desirable as police, guard, and search and rescue dogs, as they are able to quickly learn various tasks and interpret instructions better than other large breeds.